Nationwide shipping from one of 12 satellite fulfillment warehouses across the US and Canada allows us the ability to provide 2 day standard delivery. 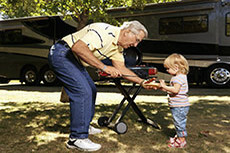 Shop our online Coachmen, Forest River Cargo, Heartland, Keystone RV, KZ RV, Prime Time, Starcraft and Thor Motor Coach parts & accessories catalog from the convenience of your computer for thousands of the most popular items. Your purchase can be picked up in our store or delivered to your home, office, campground, or any other location in the United States. Let our knowledgeable parts and accessories consultants bring you the highest level of satisfaction you deserve. Stop in and see for yourself what sets us apart form the competition and let our professional parts and accessory experts help you find that perfect item for your class A motorhome, class B motorhome, class C motorhome, fifth wheel, small trailer, toy hauler or travel trailer . 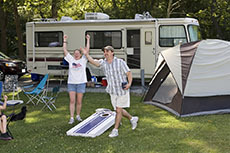 Our RV Accessories Ambassadors are dedicated to helping with all your RV needs. "Great experience, the people here are very helpful and answered all my questions and a few more that I didn't know I had." "Your Parts & Service were the BEST." "Took care of everything and I'm very happy with how I was treated! I would tell friends and family about your great customer service. Bobby is outstanding." "Amy, thanks again for the above & beyond treatment we've recieved. You're the best & we wanted you to know we appreciate you." What Parts and Accessories does a Person need for their First RV Purchase? If I Need Hard-to-Find Parts For Small Travel Trailers, Then How Quickly Can You Get It To The Store? Parts for small travel trailers and other models usually arrive within 1-3 business days. Because we have 12 satellite warehouses across the nation, we usually can have most items shipped within 2 days. I Need Some Parts For My Keystone RV That Aren't Found In Your Catalog. Can I still Get them Through You? We often have over 16,000 parts and accessories in stock or can order those hard to find parts that are not featured in our catalog. Let us know what kind of Keystone RV part you’re looking for and we’ll find it in our system of more than 220,000 parts for you. We can also order manufacturer parts such as Jayco, Forest River, etc. I Found A Competitor Price For Parts For Toy Hauler Trailers That Is Lower Than Yours. Will You Honor it? Of course, Cousins RV will price match most items including toy hauler trailers parts, but call us with the item of the lower advertised price. Is Cousins RV Knowledgeable About All It's Parts? Despite being an RV dealer with so many brands and models to choose from, our parts department knows each and every machine inside and out. If you have any questions, give them a call and they’ll find the answer you need. Can I Order Starcraft RV Parts From You And Have Them Delivered Directly To My Residence? Give us a call for current rates for shipping charges and we can have that item at your doorstep in no time. Is There An RV Graveyard That I Can Call Or Visit To Look For A Specific Old Part That You Can't Find For Me? Yes, the RV Basics web site has a very comprehensive page with several dozen used RV parts and RV salvage yards for motorhomes, travel trailers and fifth wheels. As Far As Safety Is Concerned, What Is The Number One RV Part I Should Watch Carefully Or Replace Regularly? Without a doubt, the single most important thing to replace on schedule is your carbon monoxide monitor. Carbon monoxide is the number one cause of poisoning deaths in the U.S. year after year. Besides the many simple steps you can take to avoid carbon monoxide from entering your living space, a good, working detector is the best line of defense in keeping you and your family safe. The thing to remember is that when any fuel is burned, it must be properly vented to the outside. This includes gasoline, natural gas, propane, wood, and coal. Improper venting is extremely serious and must be fixed immediately. I purchased a used RV. Where can I get an owner's manual for it? There are many great places online to look for your manual, but the best place to start is to contact the manufacturer of your RV, by email or phone, and ask if one for your model is available for download from their website. If not, ask if they can mail one out. They will usually do this for a very small fee.Some manufacturers want you to order their manual through a dealer, so dealers are used to these requests. Another good idea would be to check Ebay. Sometimes Facebook can bring about results if you go to the manufacturer’s page and ask there. If the age of your RV is too old to locate an original manual, there are a number of RV Handbooks for sale.